SSC NWR Syllabus 2016 : Staff Selection Commission Conducts Written Examination for the Selection of Candidates for Group B and Group C Vacancies in North Western Region. So to get the Job in SSC North Western Region one should qualify in the SSC NWR Group C Written Exam. To score good marks in the written test refer the SSC North Western Region Group B Exam Pattern. After successful completion of registration process, everybody is eagerly searching for the SSC Chandigarh Group-C Exam Pattern details to start the preparation. SSC NWR Recruitment Notification for 171 Group B & Group C Vacancies has recently published by the Staff Selection Commission, Chandigarh on 27th August 2016. Aspirants interested in Central Government Jobs can apply for these Group C & Group B Jobs in SSC NWR from 27th August 2016 to 26th September 2016. But to get the Job in SSC North Western Region, candidates must attend the Written Exam conducted by the Staff Selection Commission. So it is advisable to refer the complete SSC NWR Syllabus and Exam Pattern to qualify in the Exam. SSC Junior Engineer Syllabus | SSC Scientific Assistant Exam Pattern : The Online Written Test conducted by the Staff Selection Commission consists of Objective Type Questions from various Subjects. The Exam Pattern is separate for Different Qualifications. Here we have the Detailed Exam Pattern for all Qualifications. There will be a 0.25 Negative Marking for each Wrong Answer in the SSC Written Exam. 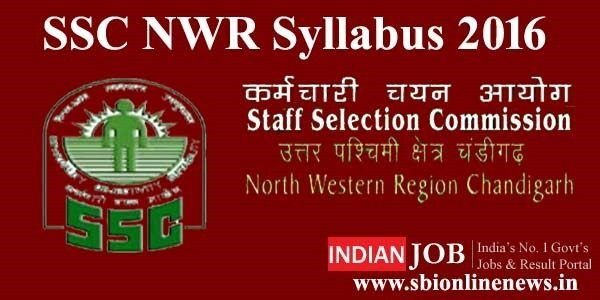 Download SSC NWR Syllabus 2016 @ sscnwr.org : Staff Selection Commission North Western Region Written Exam will contain Objective type Questions from different Subjects. Here we are giving related topics from which the questions will be asked in the SC NWR Group C Written Exam. Those Topics are mentioned below. Staff Selection Commission will cover all these subjects in the exam. Topics For Static GK : Indian History, Politics, Geography, Arts, Culture. Topics For General Science : Physics, Chemistry, Defence, Agriculture, Space, Environment, Biology, Agriculture. Topics For Current Affairs : Economy, Banking, Awards, Sports, International Affairs, Current Events. 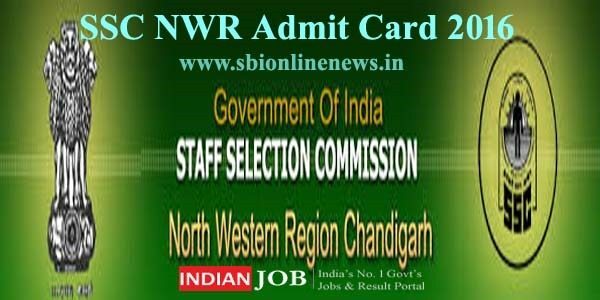 SSC NWR Exam Admit Card 2016 : The aspirants who applied for the post can download their admit cards from the website few days before the exam date. The candidates can check the below instructions to download their SSC NWR Hall tickets from the website. Candidates log on to the Official website www.sscnwr.org. Open the given NWR Recruitment 2016 link. Click on the Official Notification and read it completely. Download the notification and follow the exam process. Prepare well for the exam as per given SSCNWR Syllabus 2016. SSC NWR Syllabus 2016 for 171 Group B Non-Gazetted and Group C Non-Technical Posts. Candidates who are waiting for SSC Latest Govt Jobs can download the SSC Syllabus & Exam Pattern in a pdf format.